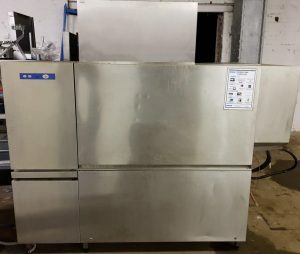 Presenting a Hobart CNA – E conveyor dish washer in excellent condition. Complete with the heat exchanger which captures waste heat and reduces power consumption. This clever hard working machine is fed from the left and exit to the right. Designed under the MiniMax principle optimising maximum performance from minimal space. This machine would be ideal for the larger kitchen catering for numbers such as a weddings, conferences, exhibitions or functions. With great savings compared to new at circa £14k +. Caterquip can supply the feeder sink, prep rinse spray and outlet drying table accordingly. Please ask for details.